This week, let’s discuss cupcakes!! 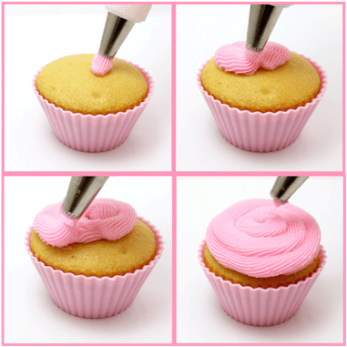 Specifically, how to pipe frosting on cupcakes and cupcake decorating. I’m pretty sure we can stop talking about cupcakes as a “trend,” too. Cupcakes are cute, decorate-able, portion-controlled perfection, and they are here to stay. But I do have a very important question for you. How do you frost cupcakes? Do you pipe the frosting on or spread the frosting with a spatula? Now I’m not averse to spreading frosting on cupcakes with a spatula. Gosh, it’s how I was raised. But once I started getting into piping, I spread no more. I find it’s so much quicker and easier to pipe frosting with a bag and tip. decorating bags. I use 12-inch disposable decorating bags, available at the craft store. It’d be easier to use larger bags because you’d be able to pipe on more cupcakes without refilling, but I use the 12-inch for cookie decorating and I don’t like to buy more than one box. So I refill every few cupcakes. frosting. 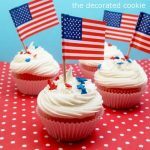 I use this recipe for frosting (not the royal icing). But you can use store-bought, too. You may want to thicken it a bit with confectioner’s sugar. 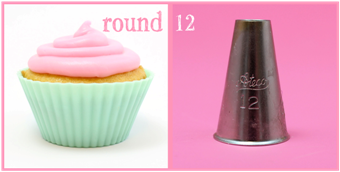 For piping cupcakes, a little thicker than the spreadable consistency in the can is preferred. You want the frosting to be thick enough to hold it’s shape (scoop a spoonful and make sure it doesn’t move) but not so super-thick you can’t squeeze it out of the bag. UPDATE: A reader asked a fabulous question, why not royal icing?? It’s all about consistency. Royal icing dries very hard (my recipe dries well enough to handle, though the other ingredients make it a little different from traditional royal icing and it doesn’t dry very hard), so it’s ideal for cookie decorating, as you are then able to handle and package your cookies. However, hard icing not so ideal for cupcakes. Better to use a butter-based frosting for those. step one: assemble the decorating bag. 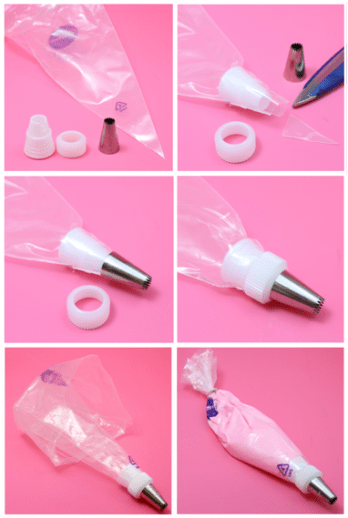 Assemble the decorating bag with a decorating tip (see below for tips on tips) and coupler. To do this, remove the ring from the coupler. Fit the coupler in side the bag with the smaller end pushed towards the point. Snip the bag beneath the edge of the coupler so the coupler fits fully inside the bag. Put the decorating tip on the edge of the coupler (over the snipped bag), and secure with the ring. Fold a cuff and put the bag in a tumbler with the cuff over the rim (I use my daughter’s Backyardigans cup). Fill with frosting, uncuff and close tightly with a rubber band. To pipe, hold the bag with your dominant hand by the rubber band. Steady the bag by placing your other hand on top of your dominant hand and squeeze with consistent pressure. 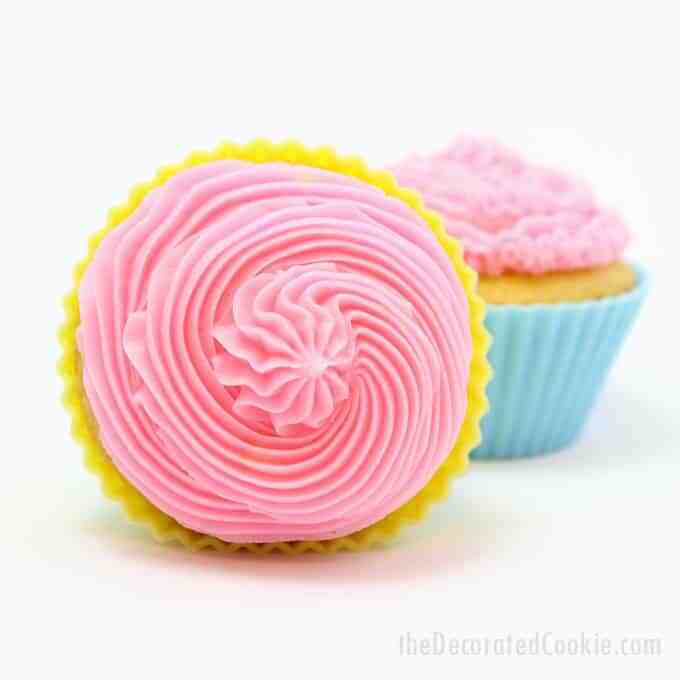 Start at the center of the cupcake, move to the edge and pipe round and round in a spiral and pull away quickly at the top. You can use pretty much any of the fancy schmancy type tips. Don’t worry too much about which one, since they all look pretty cool. You got your open star (with teeth), closed star (with teeth turned in), petals (long and flat), round (um, round)… I’m partial to the open stars, less teeth, the bigger the better. Below are a few examples… Missing from this list below is the size 1M tip. My new favorite! now let’s get to the GIVEAWAY!! and I’m throwing in some cupcake liners, too! I want to win. I have your book pre-ordered and I can hardly wait until it arrives!! WOO HOO! Love all your work!! I was not lucky last week so hopefully I will be luckier this week – love your blog and your giveaway. LOVE to pipe frosting onto my cupcakes. It's SO much easier! Can't wait to see your book…it'd be awesome to get a sneak peek! Thanks for the quick tutorial and the great giveaway! Thank you so much for the post! I had one of those AH HA! moments. I always fight with the bag as I try to fill it, I never thought to put it in a cup, with the bag opened & rolled over the sides! Genius! (and why didn't I think of that ha ha!!!!) We appreciate your give-aways as well!!! Thanks a million!!!!!! Since I have been introduced to the wonderful world of tips I pipe. Great giveaway. I have pre-ordered your book from Amazon and can't wait until it arrives! In the mean time I'd love the sneek peek and the prize. Your work is fantastic and I've followed you for over a year. I also use your icing recipe and love it. Thanks for the inspiration! I always pipe. I find it too difficult to ice by hand. Love your tips. Thank you for sharing! Love your blog, I need to win!!! I'm still battling the piping technique. I follow your instructions to the "t". Would love to win your wonderful prizes. You are the best. Can't wait to get your book next month. I need all the help and tips that I can get. It looks so easy! I enjoy so much your blog and ideas that this would just make my february even better. I would love to win. Thanks for a chance to win. Your stuff is just soooo cute! I really hope to win this ! I use both methods of frosting cupcakes. For me it really depends on the occasion. I am adding to my piping tip collection and I would love to win a few more! I love making and decorating cupcakes. I mostly pipe the frosting unless theme requires flat surface then I spread. Love your blog and look forward to winning this lovely giveaway. 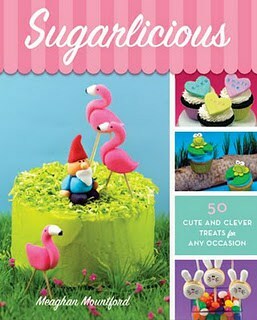 Thanks for the opportunity and good luck with the release of Sugarlicious book! I love to PIPE. Then, if I want it smoother I just smooth with my spatula. Less mess that way. I learned the bag in a cup trick in a decorating class years ago and it just rocked my world! Awesome tip. I usually spread, but you made piping look so easy, I'll have to try! Thanks for the giveaway! HI! I'm like you…i used to spread like my mom used to do until I learned about a piping bag and tip!!! I would love to make pretty cupcakes like this. Mine are always so boring. I always pipe my cupcakes, it's so easy and actually saves time over spreading. Of course I want to win. I like to pipe frosting as well, I'm still learning, boy on TV decorating cakes and cupcakes looks so easy but it's not that easy. At least not for me, I know practice makes perfect. I try my best! I may take a cake decorating class down the street from my house to get the hang of it. I would love to win this prize pack. I love baking and getting better is one of my goals. I currently spread frosting, but am hoping that after the cake decorating class I take in a few weeks I will be better at piping! I would love to win that prize pack!! I'm so happy to be able to leave a comment today. It wouldn't work yesterday for some reason, so yay for today. Thank you for the giveaway and opportunity to win. Congratulations on all your hard work paying off! Thank you for the tips today-great post! What a fun, fun giveaway! Would love to win! I have and love your first book, 2nd book is on preorder and can't wait!! Would love to win!! Great tutorial! I frost my cupcakes the old fashion way with a knife. But I am going to try piping the frosting next time. Looks very easy. 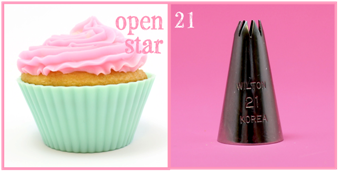 I like to frost my cupcakes with either the star or open tips. But by the time we add some sprinkled, or sugar decorations, it kinda doesn't matter. I love experimenting w/ ideas, so thanks for sharing! awesome! thanks for a chance to win! 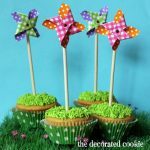 Great cupcake frosting tutorial..I need to branch out of the 1M that is for sure…I like the ruffle feel of the 2D tip too….I am getting SO excited for you!! Oh, me, me, pick me!!!! In the past, I've always just spread…but now I am inspired to pipe. I have all the tools, so hopefully it will work. Thanks for the tips on how to fill the bag. That always seems like the messiest part. Would love to win! Everything looks like fun to use. This prize is adorable! I know someone who would LOVE it! This book looks awesome! I would love to win. By the way, I pipe frosting onto my cupcakes. Love the neater look! What an exciting prize package…I would love to win. I spread the cupcakes still most of the time but love the look of piping it. Congrats on your book! Thanks for the chance to win! i like to frost my cupcakes as high as gravity will allow. a ratio of frosting to cake 4:1 works for me. Would love to win this for my daughter as she is getting ready to leave for culinary school and decorating is her passion. I always pipe and I'd love to win! I usually pipe icing on cupcakes. I did find a neat technique that was intended for cookies, but I think it applies to anything iced. It makes clean-up a breeze, especially when using non-disposable bags. My daughter and I love to bake, and hope to win your book! Hopefully I will win this week :0) I frost my cupcakes using the same techniques you use. I like using a 1M or 2D tip with a large coupler and disposable piping bags. Congrats again on your new book!! I tend to pipe frosting. I would so love to win this! I found your blog like class for me.Thank you! Thank you! My cupcakes were not so cute, and now I know where I went wrong. Your giveaway looks super fun. I hope choose me! I haven't made very many cupcakes as of late but will be making some soon and plan to pipe on the frosting. It looks so much prettier that way. I'm a spatula spreader, but might have to break out the old piping supplies! Very pretty! Please enter me in this week's giveaway! 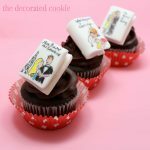 I always pipe frosting on my cupcakes and would love the prize pack! Piping Frosting is definitely the way to go!!! It's very fast, easy and looks "professional!" And, best of all, no messy, sticky fingers!! Looking forward to your book!!! I pre-ordered it on Amazon as soon as you announced it!! Would LOVE to get a sneak peek! 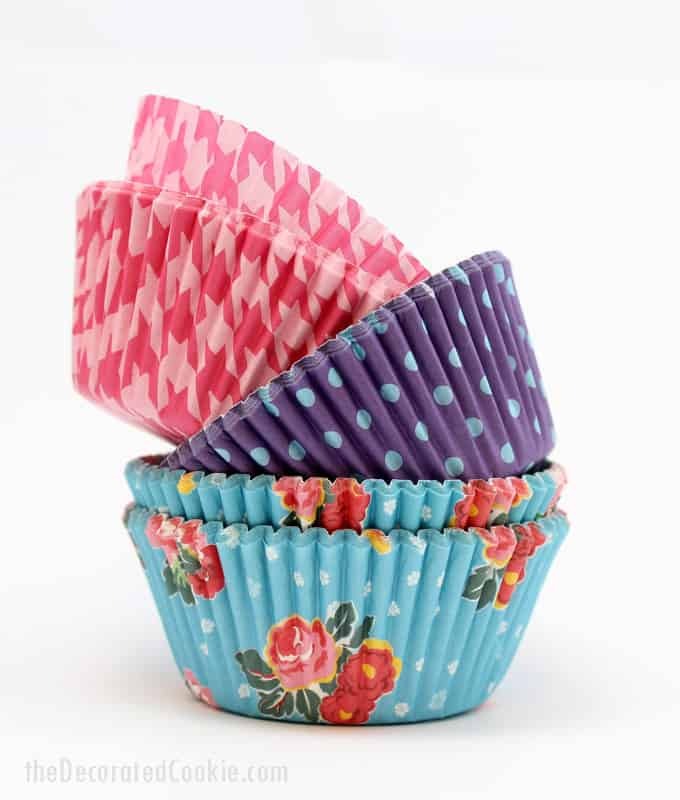 I love the pink houndstooth cupcake liners! I would love to win!!!!!!!! Thank you for showing the different techniques with the tips!!! Very helpful. 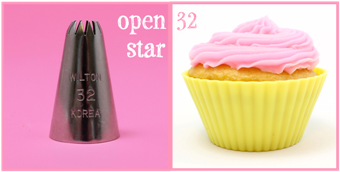 I pipe with an open star and want to win! I use a good old spatula but it looks easy enough to pipe it on. I'll have to try it! I just started piping my cupcakes. I use to use just a spatula and I course your awesome frosting, but decided to step it up now that my daughter is growing up and actually cares about presentation rather than just te taste. I agree that once I started piping it was much easier and faster. I also start out piping from the outside and then in. I'll have to try it the way you recommended and see what works better. Always love your post! I would love to win! I'm just getting into cookie decorating and I'm so glad I found your blog. Can't wait for your book! I would LOVE to win this amazing prize pack :)! I just stumbled onto your website and I LOVE it! I am definitely a "piper". There is a time to spread and a time to pipe and I mostly pipe. I am also addicted to mini-cookie cutters because the shapes fit so perfectly on my cupcakes! I LOVE your blog and the recipes and the ideas and the PINK! 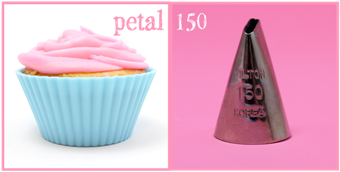 I like to pipe on my cupcakes….spreading tends to pull the cake off and not as pretty! I'm SUPER excited to get your book….and LOVE the pink! Here's to hoping to win! Piping is the way to go!! Can't wait til the book is finally out. I would love to win this package. I have a cookie cutter club meeting February 4th with a country theme and we are suppose to wear an apron. I don't own an apron. If I win the apron everyone will ask what my apron means and I can tell them about your new book. They love that kind of stuff. Hey it's Kate the lady that makes the peacock cookies. I use a spatula but only because I don't have decorator bags or tips. I'd love to invest in some someday, but I am disabled and unable to work, so it isn't in the budget right now. Piping makes them so pretty! I am new to baking and blogging (is that what you call it?). In fact, yours is the first one I have subscribed to. I love the cover of your book and the beautiful and delicious looking things you make. I do have a question: Why NOT royal icing? And what is royal icing? I would love to win, but will be happy to know that you and your site (blog?) are here for me to come to for help and ideas. I would love to win! I have just recently had the time to read more blogs (since been laid off, after 20 years). My husband is encouraging me to follow my love of cooking and mainly baking and see what I can do with it! It would be wonderful to have these beautiful items!! xoxox You have a very wonderful blog!! Thanks for the great tutorial and the chance to win the awesome giveaway!! Thanks for all the great decorating tips! What a great prize package! Thanks for the decorating tips! What a GREAT giveaway for bakers like me. I would love to share this with my son's girlfriend, as she is learning to bake and loves it. I enjoyed your tutorial on how to pipe very much. I usually use the round tip but I would like to try using the petal tip. I want to win!! Congratulations on your book. Maybe today is a less crazy day for you! Would love to win your sneak peek prize pak. My son loves cupcakes! Great giveaway! Would love to win it. These prizes are adorable! I love to bake and I love the decorated cookie! My baking buddies (aka my neighbors, best friends, basically sisters) bake cupcakes all the time! The girls always let me pipe the frosting on because its my favorite part! (besides tasting) Would love to win! We are 18, 13 and 10 and someday hope to own our own bakery! Thanks you for your tips and blog! Love it! I'm from central america and I definitely admire your work of art! I'm getting ready to buy your book on february! I have family in california who would receive the delivery and send it down here to me! i really want to win!!! I both pipe frosting and use a knife to spread. Depends on if the kids are helping! Thank you for your blog. Just found you today because I was searching for decorating cupcakes for a special program where I am providing refreshments! I'd love to win!!!! I use a spatula but after reading your directions I'll certainly try piping them. Used your cookie icing recipe "Almost Royal Icing" during the holidays and it worked just great. So much better than just royal icing. My grandchildren had a ball decorating all those cookies and with the new icing recipe they even tasted good. I also used to spatula, but now only use a decorating bag and tip. SOOO much easier, and prettier too! Love your site and want this book! AWESOME giveaway, my fingers are crossed! Thanks for the chance and God bless! I have found it's so much fun to pipe the frosting on that I tend to do that more. And I have to admit that I haven't tried different tips, so now I'm going to give that a go as well. Thanks! I always use decorating tips to frost my cupcakes. Thanks for the wonderful tips! Sign me up to win! I've pre-ordered your book.. cannot wait!! Please enter me in your drawing! And I agree with you. Once I started piping frosting on my cupcakes there was no going back. It just gives it a cuter look in my opinion! Can't wait to see your book. Love your blog! and would love to win 🙂 keep up the amazing work! I pipe, crazy flowers, grass, swirls, stars … it takes forever, but it's the best part of baking cupcakes 🙂 Oh yes, if I do win – it's not for me but my very dearest friend, I have only seen once in 8 years .. Love my best friend, Susan from Provo Utah .. I just discovered your blog through pinterest, and am now a new follower. Congrats on the new book. I look forward to following. Piping is soooo much easier. I love cupcakes. Yum! Please enter me in your drawing. 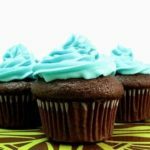 I frost my cupcakes the easy way – with piping bags! I just found your blog, and am loving it! I'm just getting into piping, and LOVE IT!!! My 5 year old daughter also love to pipe, and she's pretty good! We'd love to win some goodies, and we are ordering your book! 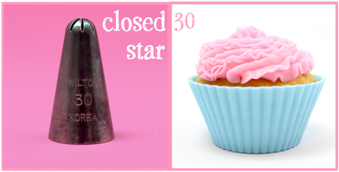 Still spreading on icing – the pink spatula would come in handy! I've always been a spreader but have been thinking I need to start piping – this would push me over the edge! Doesn't it take more frosting that way? It looks like it would. Thanks for all the help and the chance at the lovely giveaway! My girls would love if we won ! My girls and I would love to win! I'm a novice at piping but would love to practice some more. Pick me!!! P.S. thanks for the opportunity to win! Congrats on the new book! I found your blog through Craft Gossip and I love it! Wonderful giveaway. I would love to give all this girly pink equipment to my granddaughter for her birthday. We spend many happy hours together baking on the weekends. Her favorite color is pink. Thanks for the opportunity to win. Congrats on your new book! I would love to win!! Wow, those are awesome looking cupcakes! I wish mine turned out like that too! I need to pipe more…love your prize pack- great giveaway! I found your blog because I would love to learn to pipe frosting!! Like your fabulous giveway, so thought I would leave a comment!! Thanks for the tips on piping and the giveaway!! I love the tutorial. Thanks and the giveaway as well. If I only have a few minutes I grab a spatula, but if I have more time I fill the cupcake and then pipe them. I pipe more often now thanks to blogs like yours! 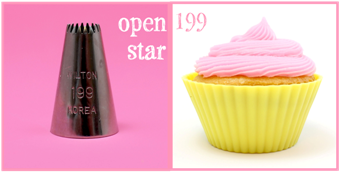 I love using the open star to decorate my cupcakes. Piping is much more fun and faster than spreading. And prettier. Great giveaway. Hope I win. so, i know your give away is over, bummer, i just found you. but anyhow, im glad i found you, i am thinking about starting an online bakery and your piping techniques are just what i needed, i can bake like no other but dont have much experience piping(none that were possitive yet) but reading this i see the error of my ways and when i make cupcakes this weekend im gonna try it your way! Thank you for this post!!! Have been obsessively reading your website in preparation for my daughter’s upcoming FIRST BDAY!! 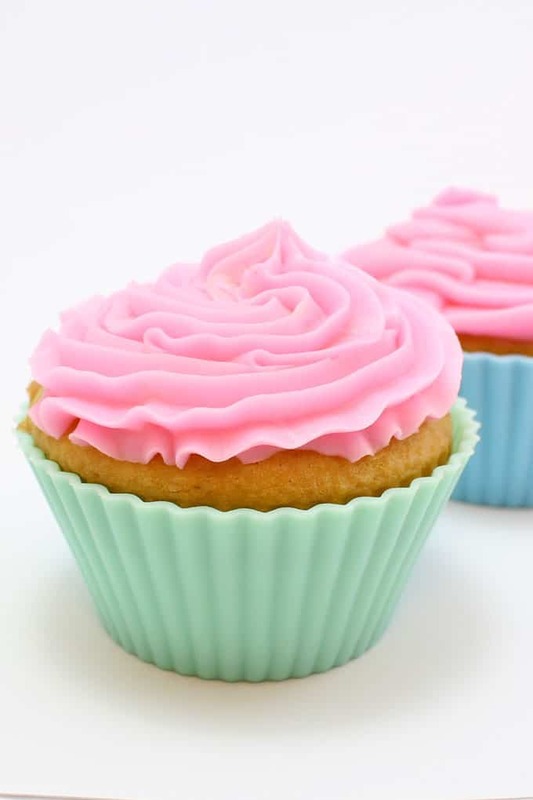 Question- for cupcakes, which store bought icing do you recommend? Hi Estee! Thanks so much! 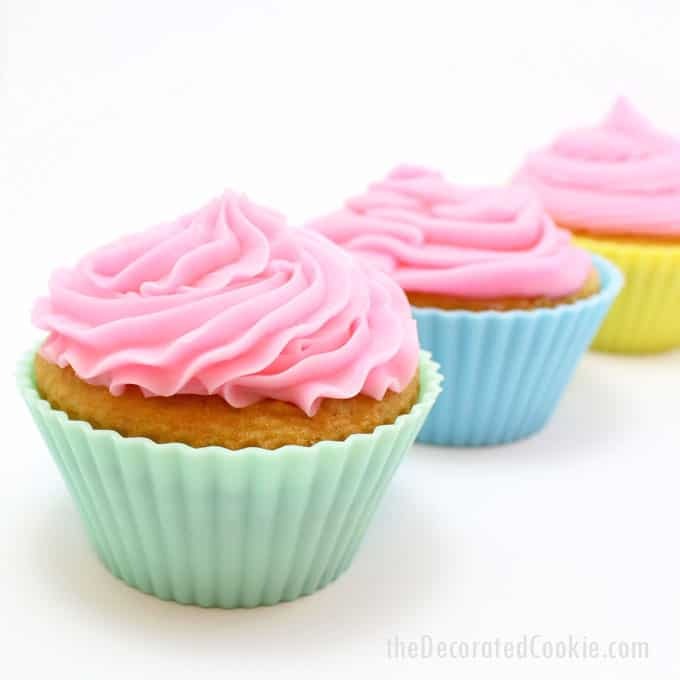 For store-bought, I just use Dunkin HInes or Betty Crocker or any of the tubs of frosting, however, to pipe the frosting on with a tip, you will have to thicken store-bought icing. Blend in confectioner’s sugar (more than you’d think, it takes quite a bit). Awesome giveaway! Me please. I am a newbie at cake decorating. I am a mother of 5 boys. Buying cakes and cup cakes are just so expensive so i decide to decorate my own. I love your ideas and previous ones too. Keep up the great work.